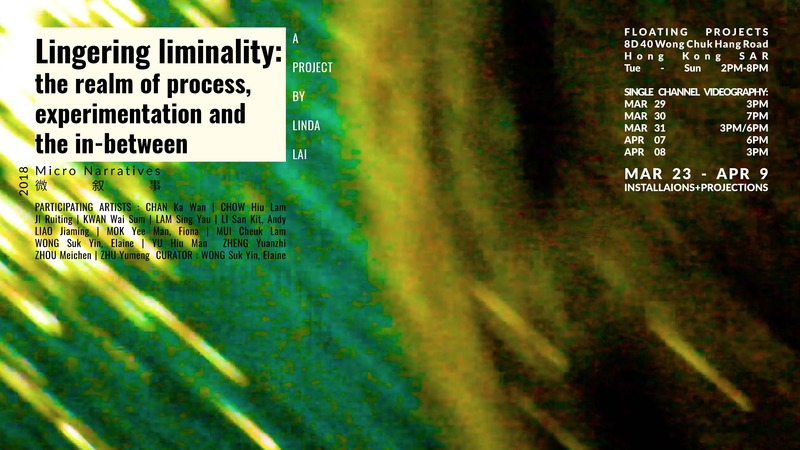 Lingering Liminality: the realm of process, experimentation and the in-between takes on as an extension stemmed from the series of experimentations during the Micro-Narratives studio sessions. From diving into thick conversations on videography to stepping in and out of the boundless scope of video experimentation, artists fully immersed in the zone of the “in-between”, where they submerge, or riskily struggle to float. Single-channel Program II: Images Are Not Images Are Images embraces the power of digital techniques as part of the package of video creation nowadays, whereby digital effects form the expanded vocabulary of moving image creation. How does this afford the artists in amplifying the possibilities of images? How does the digitally expanded vocabulary enrich the practice of montage and intermedia executions? How does the ease of imaging afford by digital tools rewrite texture, rhythm, visual musicality and temporal experiences? Day 7300: Gelatinization, a site-specific video installation, features a collaborative project in pushing the perceptual limit of time and space in video. As it is aptly named, its undertone of simulating the experience of urban living which unveils the bottom of the hearts, blurring the boundary between imaginary and reality by blending moving images in daily objects. Lingering Liminality is perhaps a manifestation made only possible after ceaseless back and forths in each individual’s experiential trajectory. It indicates the many points of convergence and divergence in the process of creation, it concludes one phase of the journey yet also points to countless daring conversations that are yet to come.